'Sunburst' squash and 'Early Girl' tomato thrive in big glazedpots. Growing vegetables can bring out the farmer in you. You till the soil and tend the plants, then reap the rewards when the plants bear fruit. Even if you don’t have much sunny ground, you can still experience the pleasure of harvesting your own vine-ripened tomatoes and other crops. All you need is a generous-size container, good potting soil, and a suitable spot―a patio, deck, or corner that gets at least six hours of full sun a day. If you do have actual ground for growing, containers can still help you overcome problems like poorly drained soil, pests such as gophers, and soil-borne diseases such as fusarium wilt, nematodes, and verticillium wilt. Also, since soil in pots warms up more quickly in spring than it does in the ground, you can get a tomato or pepper off to a faster start. And tall pots make it easier for gardeners with limited mobility to tend crops without kneeling or squatting. 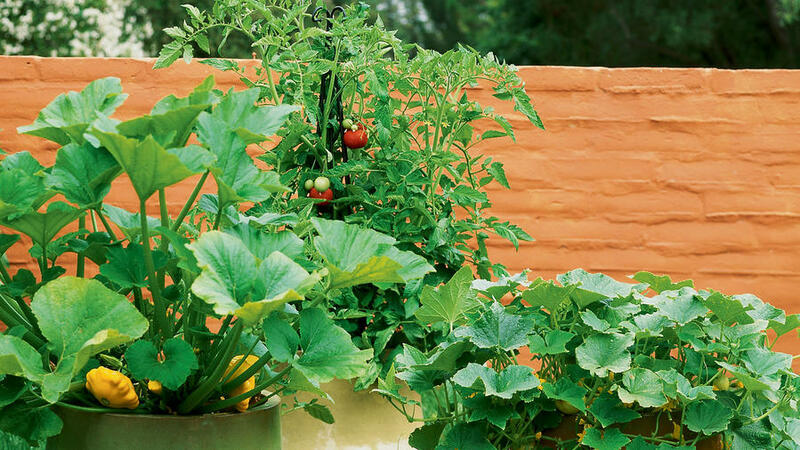 Vegetables in containers add visual punch to the landscape. Choose large, decorative containers and surround them with smaller pots of colorful flowers, and you’ll have attractive focal points―and a bounty of vegetables―all summer long. Garden designer Rosalind Creasy of Los Altos, California (650/948-1588), even displays potted vegetables such as golden squash and fiery red peppers in her front yard (pictured above). Potting medium. Use a high-quality mix containing peat moss and perlite. Blend in a complete fertilizer, either a dry organic product―such as one containing alfalfa meal, bonemeal, kelp meal, or other natural nutrients―or a controlled-release type that supplies nutrients over a three- to six-month period. If you plan to water pots by hand, add soil polymers such as Broadleaf P4 (available at most garden centers) to the mix before planting to help alleviate the wet-dry cycle. As the soil dries out, these small crystals, which absorb a hundred or more times their weight in water, supply moisture to the roots. Feeding. If you use an organic fertilizer at planting time, supplement it with weekly applications of fish emulsion or reapply dry organic fertilizer according to package directions. If you use controlled-release fertilizer, give vegetables a boost by applying fish emulsion every two to three weeks. Watering. The best way to water vegetables in containers is with drip irrigation operated by an automatic controller. For each container, install a circle of inline emitters over the soil or distribute three or four 1/2-gallon-per-hour emitters over the soil surface (use more for very large pots). Set the controller to water often enough to keep the soil moist (in hot climates, that might be daily or every other day). If you hand-water, never allow the soil to dry out completely. Pests. If aphids, mites, or whiteflies attack, spray them with insecticidal soap or horticultural oil. Handpick and destroy tomato hornworms. Harvest. Pick crops when they’re ripe: beans before the seeds swell inside the pods; cucumbers and squash when fruits are fully expanded but not seedy; eggplants while skin is shiny; peppers when fully grown and showing appropriate color (green, red, or another shade); tomatoes when fully colored (red, orange, or yellow). Sources. Most nurseries and garden centers sell seeds and seedlings of common summer vegetables. For unusual varieties and potato tubers, try these specialists. The Natural Gardening Company (707/766-9303) sells certified organic seeds, potato tubers, and seedlings of eggplants, peppers, and tomatoes. Seeds of Change sells certified organic seeds, potato tubers, and seedlings of peppers and tomatoes. Territorial Seed Company sells seeds, potato tubers, and seedlings of eggplants, peppers, and tomatoes.